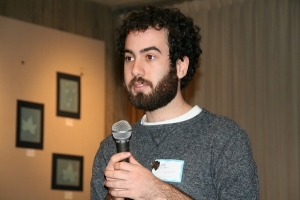 DisabledCommunity.Org (DCO) started the information clearinghouse using Backflip.com. 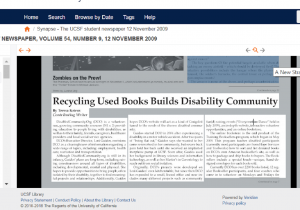 The August, 2004 version of DisabledCommunity.Org courtesy of the Internet Archive’s Way Back Machine. DCO’s first office was at the San Francisco Mayor’s Office on Disability. 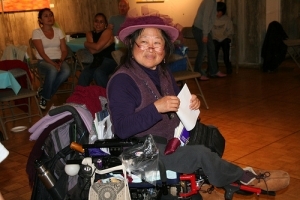 DisabledCommunity.Org’s mission was to be a clearinghouse of disability resources and information designed to help improve the quality of life for people with disabilities, their friends, caregivers and social service agencies. 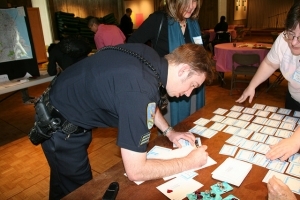 While the event was planned as a kickoff for DisabledCommunity.Org; it turned into an informational networking event with many agencies introducing their staff and explaining their agency’s missions. A fair share of individuals also participated some complained about the availability of affordable housing and it’s equitable distribution. 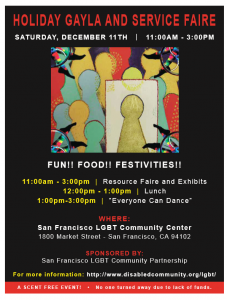 The event was organized by DCO and the Equual Access Committee of The First Unitarian Unversalist Society of San Francisco and was free and open to the community. Additional photos of the event are linked to the title above. Matthew Windwer, Treasurer and volunteer programmer explained at the kickoff celebration for DisabledCommunity.Org why he is interested in disabilities and why he helped to migrate the DisabledCommunity.Org (DCO) database over to Ruby on Rails in order to create a better more accessible website for the organization. Matt had his own project called “Stuck in Bed” which was the sponsoring organization of DCO. The newest version of the website was released in April of 2008. The title above links to the version that was active back then (courtesy of the Internet Archive’s Way Back Machine). 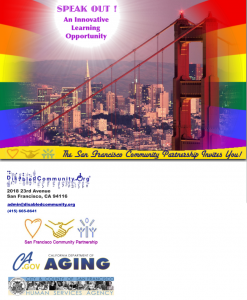 DisabledCommunity.Org organized the forum through a grant from the California Department on Aging. The goals of this event was to educate service providers about adults with disabilities and to provide an opportunity for these service providers to network with colleagues in the field of aging and disability. 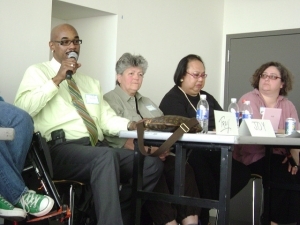 The forum of 8 panelists aged 33-59 educated social service providers about their stories about living in the San Francisco with a disability. The panelists also shared what services they have used and what additional services would be helpful to them. 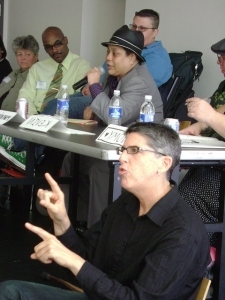 The event was held at the SF LGBT Community Center and over 100 people attended the event including 8 adults with disabilities who were panelists. 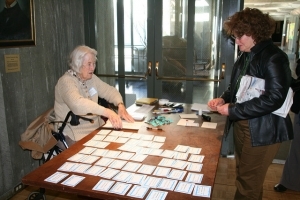 Download Transcript: Disabled Community Event 11.12.08. Click title link for additional photos. 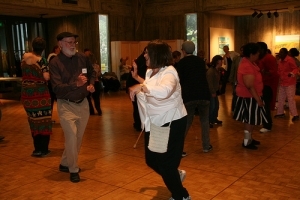 Many San Francisco community based organizations focused on disability issues are holding a dance to celebrate disability pride month and the anniversary of the ADA. 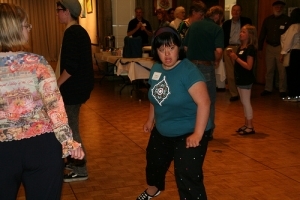 The dance appropriately named “Everyone Can Dance” provides an opportunity for people of all abilities to explore and advance the concept of self expression through movement. This event promotes the importance of self love and social movement as antidotes for alienation and isolation within our community. 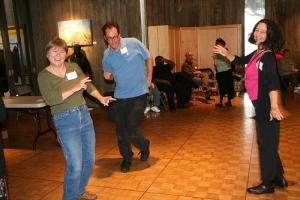 To promote social movement in the lives of people with disabilities and to recognize that everyone can dance. 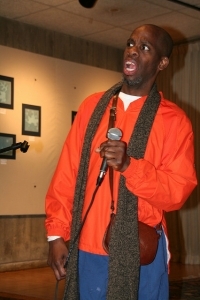 DisabledCommunity.Org was awarded it’s letter of determination as a 501c3 on August 30th, 2009. If you know of a foundation or individual who might be interested in funding our work, please pass on DCO’s Letter of Determination. 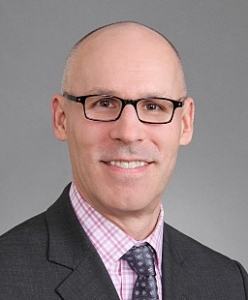 Thanks especially goes to Nathan Fahrer of Perkins Coie for helping us through filing the proper forms with the IRS. 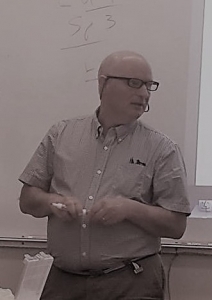 DisabledCommunity.Org (DCO) is a volunteer run, growing community resource (501 c 3) providing education to people living with disabilities, as well as to their family, friends, caregivers, healthcare providers and local social service agencies. DCO’s Executive Director, Lori Guidos, envisions DCO as a clearinghouse of information regarding a wide range of topics, including: employment, health care, recreation and transportation. 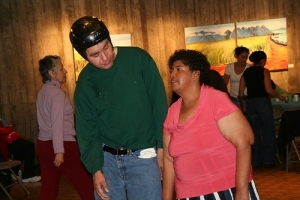 Although DisabledCommunity.org is still in its infancy, Guidos’ plans are long-term, including raising consciousness around all types of disabilities, including developmental, mental and physical. She hopes to provide opportunities to bring people, often isolated by their disability, together to find meaningful projects and relationships. 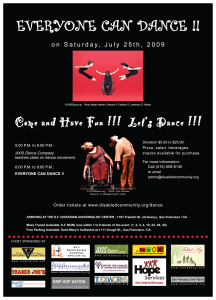 fun(d)-raising events (“Everyone Can Dance” held in July 2009), an in-depth website, interactive volunteer opportunities, and an online bookstore. The online bookstore is the end product of the Training Booksellers program, which began in May 2009. 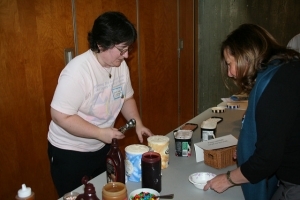 This program teaches disabled participants (currently most participants are from Hope Services and Toolworks) how to sort and list donated books on DCO’s own Amazon bookseller’s site, as well as how to package and ship books to buyers. The Booksellers include a special touch —unique, hand-designed envelopes for each book sold. Currently DCO has over 2200 books listed, 12 regular Bookseller participants, and four coaches who come in to volunteer on Mondays and Fridays for two hours shifts. Guidos hopes other people living with different kinds of disabilities will become involved with this project. On a recent visit to the DCO office, I sat down with a few of the Booksellers to get a sense of the path a donated book takes after arriving in their hands. Miles Fong and Jonas Ramirez both work with incoming donations, listing books on the website by ISBN code or title. Guidos then alphabetizes and shelves the books because it is a more complicated task. Cassie Alvarado, Scott Digre, and Luke “Duke” Claussen draw pictures on mailing envelopes and package the books. Daniel Copenhauer enjoys counting and depositing the money made from sales. Janine Dobleman is being trained to tracking expenses. Together the team walks the sold books to be mailed at the Potrero Center post office, where they are recognized and welcomed by the staff. 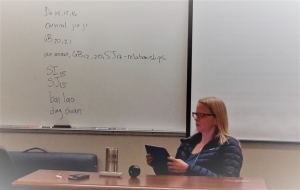 Cathy Hochanadel, a Community Support Facilitator at Hope Services in Pacifica, reports that participants anticipate their weekly visit to DCOs office and chat about the number of books they hope will be awaiting their arrival. The Kalmanovitz Library on the Parnassus campus has a conveniently located drop box for donating books to the DCO Bookseller program [across from the Service Desk by the main entrance]. DCO appreciates all book donations, but finds that textbooks provide the most sales revenue, allowing them to expand on currently offered programs. The current book drive will continue through the first weeks of the winter semester. Please consider donating your texts to this good cause! Local pick-up of your books in exchange for a tax receipt can be scheduled at your convenience by calling: 415-508-6130. Teresa Reims is a second-year nurse-midwifery student. 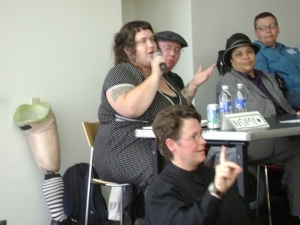 In 2009, DisabledCommunity.Org opened it’s first official office at 1550 Bryant Street, San Francisco, California. 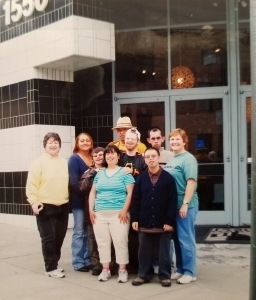 DCO had a temporary office at the Mayor’s Office on Disability in 2004, but the Bryant Street Hamm Building was our first official location DCO branched out from information sharing to education, by expanding it’s programs to teach people with disabilities to run an online bookstore. In 2010, DCO teamed up with members of Hope Services and Toolworks to run the online bookstore at San Francisco’s Renaissance Entrepreneurship Center. 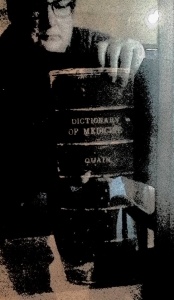 Books were donated to the program from individuals and UCSF Medical Library. Gayla, Resource Fair and "Everyone Can Dance"
In 2010 DisabledCommunity.Org and the LGBT Community Partnership organized a Gayla, Resource Faire and “Everyone Can Dance!” event. 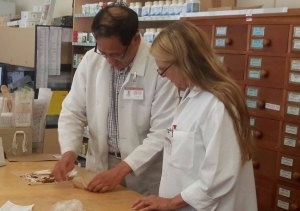 Lori Guidos, Executive Director of DisabledCommunity.Org began studying Traditional Chinese Medicine at the American College of Traditional Chinese Medicine at the California Institute of Integral Studies to learn more about pain relief and to find out if it could help her and others. She has been studying with experts in rehabilitative medicine. 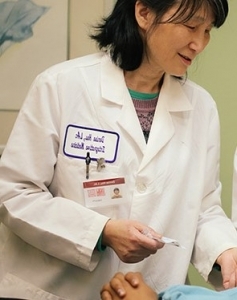 Lori has always planned to continue DisabledCommunity.Org with the goal as to educating about pain conditions. 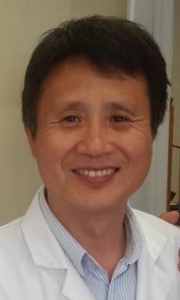 Pain Free Clinic has a simple mission: to help those suffering with pain. DisabledCommunity’s Pain Free Clinic will be collaborating with a team of professionals who will teach workshops on reduce your pain levels through self care techniques. 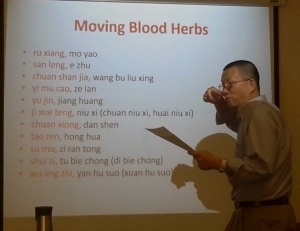 DCO plans to educate about Traditional Chinese Medicine’s tools and techniques for relieving pain. 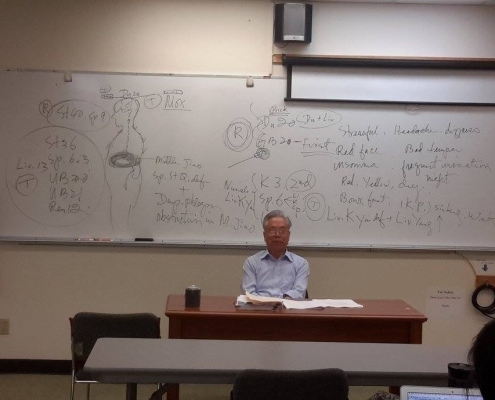 You will learn about the tools of Chinese medicine and how they have been developed over centuries to help the body and mind learn how to balance itself. 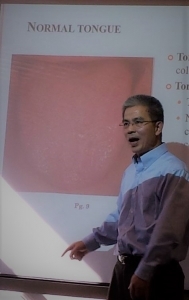 Many people suffer from pain. Whether your job requires sitting at a desk or hauling furniture, it will cause pain. Injuries that don’t heal fully leave pain that persists for years. Stress causes pain. Aging causes pain. People walk around with their collections of pain, thinking that the accumulation of discomfort is what it means to have a body. We can help you learn to manage your pain. Register for Tickets <- Click here! Please join us for a party on Sunday October 7th on the rooftop of Hotel Via in downtown San Francisco. We’re opening up an acupuncture clinic, that we’re calling Pain Free Clinic. It’s a 501(c)3 nonprofit and this little event is launching it into the world! On the roof of Hotel Via, which is down by the water in China Basin and just across the street from AT&T park, you’ll get a 360 degree view of SF, Oakland and beyond. We’ve got a couple of circus acts lined up for you too. The inimitable Fleeky Flanco, a staple of the SF scene for over 15 years, will be doing contortion in a barrel. Fiona Venefica, who grew up in a circus school, will be showing us what it’s like when circus is in your blood. To round the afternoon off we will have a short, non-traditional auction. It’ll be a bit too complicated and a lot of fun and you’ll be bidding on champagne and weekends away and lots more, so come ready to play. We are looking forward to sharing an afternoon of food, drink, circus and music with you, all while building a base of funding for our mission!